Rickey was born in Stockdale, Ohio, the son of Jacob Frank Rickey and Emily Brown Rickey. Rickey was a relative of Beth Rickey, a Louisiana political activist. Sir Knight Branch Rickey was a brother and Master Mason in Tuscan Lodge #240 in Saint Louis. After arriving in Brooklyn Branch Rickey joined Montauk Masonic Lodge #286 in Brooklyn. In 1902, Rickey played professional football for the Shelby Blues of the "Ohio League," the direct predecessor to the modern National Football League (NFL.) Rickey often played for pay with Shelby while he was attending Ohio Wesleyan. During his time with Shelby, Rickey became friends with his teammate Charles Follis, who was the first black professional football player. 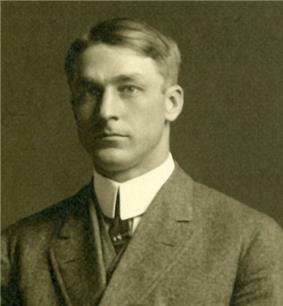 He also played against him on October 17, 1903, when Follis ran for a 70-yard touchdown against the Ohio Wesleyan football team. After that game Rickey praised Follis, calling him "a wonder." It is also possible that Follis' poise and class under the pressures of such racial tension, as well as his exceptional play in spite of it, could have inspired Rickey to sign Jackie Robinson decades later. In 1903, Rickey signed a contract with Terre Haute, Indiana of the Class B Central League, making his professional debut on June 20. Rickey was assigned to Le Mars, Iowa of the Class D Iowa-South Dakota League. During this period, Rickey also spent two seasons—1904 and 1905—coaching baseball, basketball and football and teaching at Allegheny College in Pennsylvania where he also served as Athletic Director. While at Michigan, Rickey applied for the job as Michigan's baseball coach. Rickey asked every alumnus he had ever met to write letters to Philip Bartelme, the school's athletic director, on his behalf. Bartelme recalled, "Day after day those letters came in." Bartelme was reportedly impressed with Rickey's passion for baseball and his idealism about the proper role of athletics on a college campus. Bartelme convinced the dean of the law school that Rickey could handle his law studies while serving as the school's baseball coach. Bartelme reportedly called Rickey into his office to tell him he had the job if only "to put a stop to those damn letters that come in every day." The hiring also marked the beginning of a lifelong friendship and business relationship between Rickey and Bartelme. Bartelme and Rickey worked together for most of the next 35 years, and in 1944 a California newspaper noted: "He and Rickey have had a close association in baseball ever since Bartelme was head of the athletic department of the University of Michigan where Rickey took to baseball just as a means to build up his failing health." Rickey returned to the big leagues in 1913, as a front office executive with the Browns. He was responsible for signing young manager for the final 12 games of the season, and managed the team for two more full seasons. But the Browns finished under .500 both years. Under Rickey's leadership as on-the-field manager for six relatively mediocre years, the Cardinals posted winning records from 1921 to 1923. Breadon fired him early in the 1925 season. However, he could not deny Rickey's acumen for player development, and offered lo let him stay to run the front office. An embittered Rickey stated, "You can't do this to me, Sam. You are ruining me." "No," Breadon responded. "I am doing you the greatest favor one man has ever done to another." Rickey had wisely invested in several minor league baseball clubs, using them to develop future talent and supplement the Cardinals major league roster. At 43 years of age upon his firing, he had been a player, manager and executive in the Major Leagues. However, there had been little indication to this point that he would ever belong in the Baseball Hall of Fame. Although he was not the first executive titled as a general manager in Major League Baseball history — his actual title was business manager — through his activities, including inventing and building the farm system), Rickey came to embody the position of the baseball operations executive who mastered scouting, player acquisition and development and business affairs, which is the definition of the modern GM. In 1950, there were four owners of the Dodgers, each with one quarter of the franchise. When one of the four died, Walter O'Malley took control of that quarter. Also in 1950, Branch Rickey's contract as Dodger president expired, and Walter O'Malley decided that were Rickey to retain the job, almost all of Rickey's power would be gone; for example, he would no longer take a percentage of every franchise sale; Rickey declined a new contract as President. Then, in order to be a majority owner, O'Malley offered to buy Rickey's portion. Seeing no reason to hold on to the club, Rickey decided to comply. However, in a final act of retaliation against O'Malley, Rickey instead offered the club percentage to a friend for a million dollars. His chances at complete franchise control at risk, O'Malley was forced to offer more money, and Rickey finally sold his portion for $1,050,000. A public speaker in his later years, on November 13, 1965, Rickey collapsed in the middle of a speech in Columbia, Missouri, as he was being elected to the Missouri Sports Hall of Fame. He had told a story of physical courage, and was about to relate an illustration from the Holy Bible, "Now I'm going to tell you a story from the Bible about spiritual courage," he said. Rickey murmured he could not continue, collapsed and never spoke again. He faltered, fell back into his seat and slipped onto the floor. He never regained consciousness. His brain was damaged when his breathing stopped momentarily, though his heart picked up its rhythm again. Through the next 26 days, hospitalized in a coma, there was little change. On Thursday, December 9, 1965 at about 10 p.m. he died of heart failure at Boone County Memorial Hospital in Columbia, Missouri, 11 days before his 84th birthday. Branch Rickey was interred at Rush Township Burial Park in Rushtown, Ohio, near where his parents, his widow Jane (who died in 1971), and three of his children (including his son, Branch Rickey Jr., who died from complications of diabetes in 1961) also rest. Rickey's grave overlooks the Scioto Valley, about three miles from his boyhood home in Lucasville, Ohio. ^ Rickey, Branch (1890–1969). "Branch Rickey papers". ^ """Tom Sharpe, "Eizabeth Ann 'Beth' Rickey, 1956-2009: David Duke nemesis dies in Santa Fe Activist who helped scuttle neo-Nazi's political career had hoped to rebuild life here. ^ Redrup, Jessie Dunathan. "Branch Rickey with Delta Tau Delta fraternity brothers". Branch Rickey Collection. Ohio Wesleyan University. Retrieved April 13, 2013. ^ "Well Known Freemasons". Grand Lodge of British Columbia. ^ Roberts, Milt (1980). "Charles Follis" (PDF). Coffin Corner (Professional Football Researchers Association) 2 (1): 1–5. ^ Nash, Kimberly. "Breaking Pro Football's Color Line: The Story of Charles W. Follis". Bleacher Report. ^ Murray Polner, Branch B. Rickey (2007). Branch Rickey: A Biography, p. 57. McFarland. ^ "Bartelme Is Scout". Fresno Bee Republican. 1944-06-20. ^ a b "Theme of the week". www.stlouis.cardinals. ^ Ilan Stavans, ed. (2012). Béisbol. The Ilan Stavans Library of Latino Civilization. Santa Barbara, CA: Greenwood. ^ Simons, William M. Alvin L. Hall, ed. The Cooperstown Symposium on Baseball and American Culture, 2000. Jefferson, NC: McFarland & Company, Inc.
^ "Branch Rickey Returns to Cardinals After 20 Years". Nevada, Missouri: Nevada Daily Mail. 30 October 1962. p. 6. Retrieved 21 August 2014. ^ Harris, Aisha (September 21, 2012). " 42Trailer Critic". ^ """Actress Kelley Jakle of "42. The McCarthy Project. March 29, 2013. Retrieved January 8, 2014.